Motorola Droid 2 stars in its first video, touts 1GHz CPU and 512MB of RAM? It's taken a long time for Nokia's MeeGo-packing N9 to make its way into our top-secret labs (the N9 moniker was first applied to early E7 prototypes), but it's here in our dirty little hands, at last, and it's glorious -- well, as glorious as a stillborn product can be, anyway. The N9 is the latest and greatest in a long line of quirky, interesting, yet ultimately flawed touchscreen experiments from Nokia that includes the Hildon-sporting 7710, a series of Maemo-based "internet tablets" (770, N800, N810, N900) and most recently, the N950 MeeGo handset for developers. 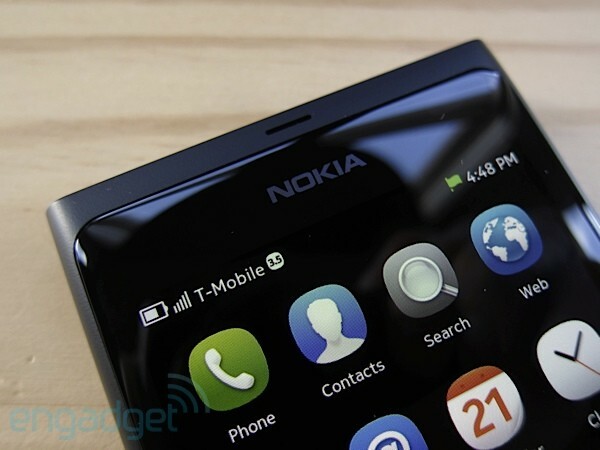 What makes the N9 special is that it represents Nokia's last flagship phone as an independent player. MeeGo is already dead, and future high-end devices from the manufacturer will run Windows Phone and use Microsoft's services. So, is this the company's final bittersweet hurrah? 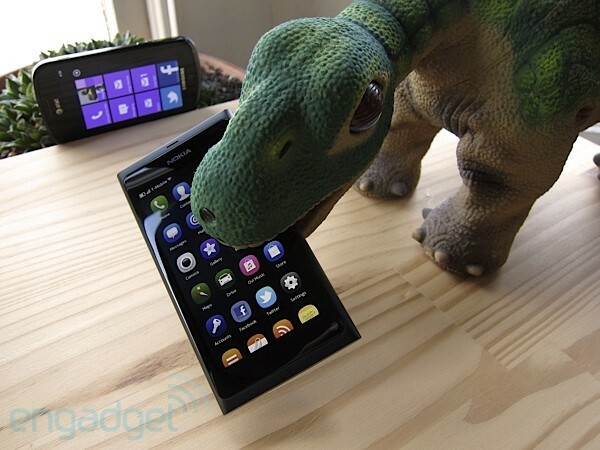 Did MeeGo ever stand a chance against Android, iOS and Mango? In its attempt to stay relevant, is Nokia throwing out the baby with the bathwater? Most importantly, how does the N9 fare in today's merciless dual-core world? Find out after the break. The Nokia N9 delivers a double punch with gorgeous hardware and brilliant software, yet it was killed before even getting a chance to prove its worth. 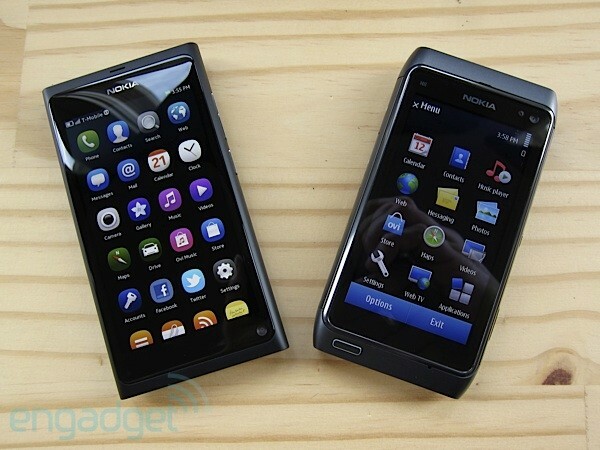 How would you rate the N9? Love at first sight -- this is possibly the most beautiful phone ever made. It's not our first hardware love affair (we're looking at you, iPhone 4S), nor likely our last, but the N9 is in a class of its own in terms of design. You've never seen anything like it, and if you think it's attractive in pictures, wait until you see it in person -- it's completely and utterly irresistible. It manages to be elegant by virtue of its minimalism yet remains unmistakably Nokia. The impeccable proportions belie the handset's 12.1mm (0.48-inch) thickness thanks to tapered ends reminiscent of its more ornate predecessor, the N8. It all starts with a colored-through polycarbonate monolith, which is machined (not cast) to form the N9's unibody. The finish looks matte and feels similar to anodized aluminum, but is significantly more durable. Our review unit came in black but cyan and magenta versions are also available. The back is slightly convex and features an oval chrome-finished (and scratch-prone) pod that's flush with the body and houses the slightly recessed eight megapixel autofocus camera. A dual-LED flash is offset to the left of the lens. The front is almost all screen with no buttons, and just a tiny slit for the earpiece on top. Curved Gorilla glass flows into the bezel like liquid spilling onto a flat surface. The 3.9-inch FWVGA (854x480) ClearBlack AMOLED display is phenomenal, rivaling Samsung's Super AMOLED -- text and graphics just appear to float on the panel, further refining the experience. You'll find a silver Nokia logo along with proximity and ambient light sensors at the top edge of the screen, and a charge indicator LED and front-facing camera at opposite ends of the bottom portion of the glass. The sides of the handset are rounded, and the right edge incorporates both a chrome volume rocker and a power / lock key. A speaker and microphone are located along the bottom, and the top side hosts a silver-rimmed 3.5mm headphone jack plus a precisely machined door protecting the micro-USB connector and flanked by the micro SIM tray. The battery is sealed and there is no microSD card slot, but the N9 comes with either 16GB or 64GB of built-in flash storage. Fit and finish are top-notch, and the 135g (4.76oz) device feels solid and comfortable in hand, with almost the exact same footprint as the familiar iPhone 4. Peek inside, and you'll be catapulted a year back to the glory days of TI's OMAP 3630 SoC (popularized by Motorola's once mighty Droid X), which combines a single-core 1GHz Cortex A8 CPU with a PowerVR SGX530 GPU. In the N9, this chipset is paired with 1GB of RAM, making it Nokia's highest specced phone to date, and promising to offer plenty of muscle without obliterating battery life, at least on paper (more on this later). Digging further, you'll find Nokia's signature pentaband UMTS / HSPA (14.4Mbps) 3G radio, a quadband GSM / EDGE 2G radio for legacy networks, NFC and the usual suspects -- WiFi a/b/g/n, Bluetooth 2.1 + EDR, GPS / AGPS. Strangely, there's no FM receiver or transmitter on the menu, unlike many of Espoo's past offerings. The N9 also features a full array of sensors, including ambient light, proximity, orientation (accelerometer) and compass (magnetometer). Not surprisingly for a Nokia phone, reception was trouble-free and calls sounded clear in our tests. We used the N9 on both T-Mobile and AT&T's 3G networks here in San Francisco and HSPA performance matched our expectations, reaching a respectable 6Mbps down and 2Mbps up in some areas. Audio quality is excellent, but the output is quieter than most other handsets when driving some headphones (like our BeyerDynamic DT990 Pro) -- as for the mono speaker, it's merely adequate. Battery life is pretty decent considering the screen size, the amount of RAM and the somewhat average-sized 1,450mAh battery. The N9 ran for about 8+ hours in our rundown test, which involves playing a video in a loop. Our usage test, which simulates a light day's use, yielded an impressive 37+ hours. As such, most people will be able to enjoy this device for an entire day on a full charge. Eight megapixel sensor, Carl Zeiss F2.2 wide-angle autofocus lens, dual-LED flash and 720p HD video recording on a flagship Nokia phone? You know where this is going. While it's no match for the legendary N8, the N9 takes wonderful pictures. Color balance and exposure are spot-on, and shots always contain a huge amount of detail, thanks in great part to the superior optics. The sensor appears to be quite small, however, which somewhat affects dynamic range and low-light performance. Like the N8, the N9 tends to preserve detail at the expense of some noise, leaving a bit of headroom for post-processing. The flash doubles as an autofocus assist light, but we sometimes experienced problems focusing in low light, especially with distant subjects. We also noticed that the white balance is off when taking pictures with the flash -- it's not a deal-breaker since the handset includes a powerful image editor with an "auto-fix" option, but we hope this gets resolved with an update. 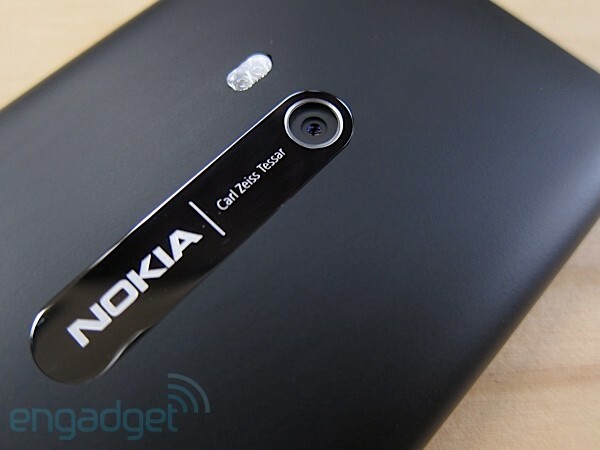 Overall, the N9's camera interface is simple and intuitive. It provides continuous autofocus, touch-to-focus and automatic face detection, but lacks features that are quickly becoming standard on other handsets, such as panorama, burst and HDR modes. Oddly, there's no way to use the front-facing camera. We experienced some usability niggles, too -- like other Nokia phones, some settings (like the flash) are reset to default when changing scenes, and there's no automatic macro (you'll have to remember to set it manually to snap closeups). While the volume rocker also doubles as a zoom control, there's no dedicated two-stage camera button. Instead, it's possible to hold the on-screen shutter key to lock focus and exposure, then release it to take the shot. Video is captured in HD at 720p / 30fps with stereo sound and continuous autofocus. The resulting videos are reasonably nice, but we noticed some dropped frames here and there, leaving room for improvement. MeeGo 1.2 Harmattan is such a breath of fresh air it will leave you gasping -- that is, until you remember that you're dealing with a dead man walking. It's impossible to dismiss what's been achieved here -- a thoroughly modern, elegant, linux-based OS with inspired design that's simple and intuitive to use, all developed in house by Nokia. Sure, it's at least a year too late, and it lacks a strong ecosystem, but still, it gives Windows Phone a serious run for its money. For one, it ships out of the gate with copy / paste and card-based multitasking. Additionally, it integrates a plethora of on-line services right in the core of the OS. Pull the N9 out of your pocket and you'll notice that the screen always faintly shows the time along with any notification icons (like @ for email) -- a screensaver-like feature inherited from other Nokia phones, which uses very little power thanks to the wonders of AMOLED (note that the position keeps changing to avoid display burn-in). From here, you either double-tap on the glass or push the power / lock key to see the lock screen with more detailed notifications, the date, as well as a status bar with battery and signal information. Slide your finger on a notification and you're taken directly to right place (the actual message for email). Alternatively, swipe from any edge across the lock screen to bring up the applications view -- a vertical grid of icons. Swiping repeatedly left or right cycles through all three views, while tapping the status bar on top allows you to set profiles (silent, beep, or ringing), adjust the volume, select connections and change your online status. Once inside an app, sliding your finger from any edge across the screen brings you back to whichever of the three views you started from. There's a also a setting that lets you swipe down to close an app, but it's turned off by default. In-app navigation is generally achieved via a series of nested screen, back buttons and long-press menus. Speaking off apps, you'll find a whole bunch of them pre-loaded, including Ovi Music, Facebook, Twitter, AccuWeather, AP Mobile, Skype, Track & Protect, Angry Birds Magic, Galaxy On Fire 2, Need For Speed Shift and Real Golf 2011. More apps are available from Nokia's bundled app store -- we installed a few helpful ones, including MeeRadio (internet radio streamer), a file manager, a voice recorder and a stopwatch / timer. As we mentioned earlier, several major online services are seamlessly integrated into MeeGo. 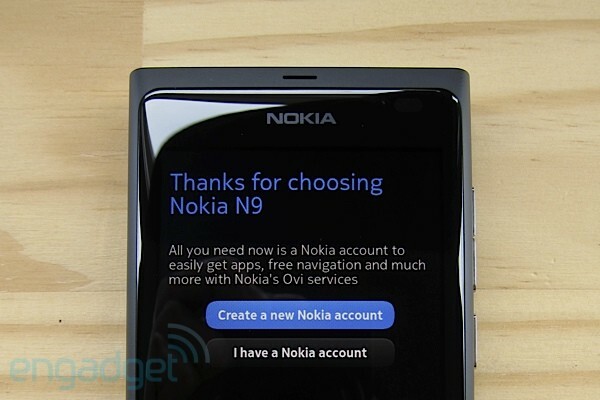 The first time you power up the N9, you're prompted to login with (or create) a Nokia account. From there, the accounts app supports Mail for Exchange, Skype, Google (for mail and chat), Facebook, Twitter, CalDAV, Flickr, IMAP / POP3, Picasa, SIP and YouTube. It's important to note that adding your Google account only gives you access to Gmail and Google talk -- you'll have to set up your Google account a second time via Mail for Exchange (and disable email sync) in order to see your contacts and calendar. But then, multiple calendars are only enabled via CalDAV -- yes, this normally simple exercise is now turning into a Kafkaesque nightmare. Sigh. At least you only have to do all this once, and the other services are easy to configure. The contacts app displays information (including online status) from your friends on Facebook, Twitter and Skype. Beyond mobile networks, the dialer lets you make phone calls directly over Skype. Google, Facebook and Skype chat are all nicely integrated in the messaging app, while the gallery seamlessly handles photo / video uploads to Facebook, Flickr, Picasa, and Youtube. Unfortunately, a few gaping holes remain. There's zero support for any of Twitter's imaging services, so we ended up using email to send our pictures to Twitpic, for example. Skype only handles audio calls and chat -- video is missing in action, and we're still not sure which app (if any) uses the front-facing camera. The SIP client, perhaps? Surfing the web on the N9 is a minimalistic affair. The HTML5-compliant, WebKit-based browser works pretty much like you'd expect, with the usual controls, including pinch-to-zoom. Each browser window appears as a separate card in the open applications view and bookmarks are stored icons in the applications view. There's no Flash support, and no browsing history beyond the ability to navigate up and down the current URL stack using the back and forward buttons. Instead, each time you open a new window you're presented with a tag cloud which contains keywords related to the sites you've already visited. Tap on a keyword, and you're taken to the appropriate site -- it's all very clever. MeeGo's email client keeps things basic. It provides a unified inbox but lacks some critical features, such as server-based search and conversation threading. There's a system-wide search app which indexes the email stored on the phone, but that's only one week's worth of messages. On the plus side, the app's layout is clean and the text is highly legible thanks to Nokia's beautiful new font, Pure (which is used throughout the OS). The client also supports pinch-to-zoom, which is still missing from Android's own Gmail app. We'd be foolish not to mention the delightful virtual keyboard at this point -- it offers unobtrusive (and defeatable) audible and tactile feedback, plus automatic word completion, when enabled. The built-in Facebook and Twitter apps will be familiar to anyone who's used the official apps on other platforms. A pair of apps are available for maps and directions, both using Nokia's excellent in-house solution (powered by NAVTEQ). The first is similar to Maps on iOS, but adds a points-of-interest view and the ability to download maps ahead of time for offline use. Drive, the second app, reminds us of Google Navigation, with an interface optimized for in-vehicle use. Both apps work very well. As you'd expect from a modern handset, the N9 also ships with decent multimedia capabilities. The music player incorporates an Ovi Music-based recommendation engine, and the video player supports a multitude of formats including MPEG4, H.264, ASP, WMV9, VC1 and Mkv (Matroska). In terms of performance, MeeGo generally feels quite snappy considering it's running on mid-range hardware. Memory management and multitasking appear to be solid, even with upwards of 20 cards in the open applications view. We've noticed random pauses when starting apps and when interacting rapidly with apps, possibly related to garbage collection. It's not a major issue, but it shows that there's plenty of room left for optimizations. As a point of reference, the retail build on our N9 is significantly faster than the developer build on our prototype N950. Of course, the real question is, will Nokia bother issuing updates for a deprecated product? Nokia's really made our lives difficult here. 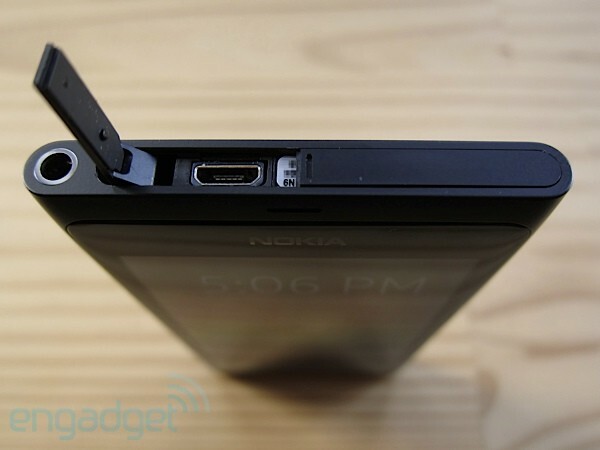 On the one hand, the N9 delivers a double punch with gorgeous hardware and brilliant software. It's arguably the first competitive flagship phone to come out of Espoo since the launch of the original iPhone -- a stunning feat when you consider how far behind the company was even just a year ago. This is the handset that puts any lingering doubts about Nokia's engineering chops to rest. We have dreams of MeeGo running on Galaxy Nexus-class superphones. Yet despite all that, it was killed before even getting a chance to prove its worth. At least the current hardware -- with its fantastic design, amazing screen and top-notch camera -- will likely be reborn as the Sea Ray (guess we'll find out at Nokia World next week). Still, it's a shame about the software, because given the choice, we'd pick MeeGo over Mango, despite its weaker ecosystem. Should you buy this device? It's difficult to recommend a platform with no future, but the N9 is everything Nokia's long time fans have been waiting for, and you could have it today. MeeGo is dead -- long live MeeGo.